Bedroom Surf Surfing Theme Beach Décor. Cruiser Art surf surfer surfing decor bedroom theme. Decorate bedroom vintage surf nostalgic surfing theme. surf surfer surfing decor bedroom theme. Bed room bedroom decoration design fashion furnishing. 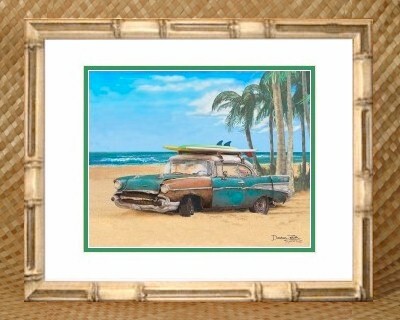 Surf surfing theme decor memorabilia 57 Chevrolet 1957 Chevy framed art print poster. We offer two attractive frame choices - Hawaiian Koa veneer (above) and Tropical Bamboo (left). Frames are available in two sizes. The smaller frame features an 11x14 inch matted version of our Chevy Bel Air open edition laser art print. 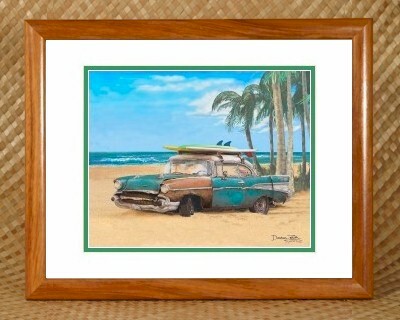 The larger frame features a 16x20 inch matted version of the Chevy Bel Air, which has the added attraction of being printed on Linen Weave textured paper (details below). The outer mat is white while the inner mat forms a green border accenting the print's vibrant colors. You may select a custom inner mat color at no additional cost. The link to the left shows options. Each print comes with a free eight chapter story in which this classic old Cruiser icon recounts its long and fascinating life. From the day it first rolls off the GM assembly line, the Chevy lives an exciting and adventurous life intertwined with historical events and contemporary figures of the time. Inevitably the ravages of age set in however, and the old Chevy is abandoned -- only to be miraculously rescued and begin a new life as a beach Cruiser. The final chapter finds the Chevy enjoying its Golden Years under a palm on a sun-drenched beach. We invite you to preview the intriguing Auto Biography that accompanies this print.